Across the entire breadth of a subject as complex as cosmology - accretion disks, the expanding universe, dark matter, red shifts, star and galaxy distribution and particular motion, light Waves, microwaves, the scale of the universe - Your Cosmic Context: An Introduction to Modern Cosmology is an excellent source of educational material. This book takes the reader along the initial steps in formalizing a scientific theory, applying the basics of science to the study of cosmology. It addresses (to list a few) gravity, units of measurement, the importance of scientific notation and applied mathematical formulas. Each chapter builds on the former and concludes with comprehension questions, essays, discussion and entertaining crosswords reviewing the material introduced. The review questions at the end of each chapter encompass mathematical content, a project idea, subject matter requiring the reader's own personal reflection, or classroom discussion. Your Cosmic Context involves the student in the scientific process and exploratory procedures with visual learning and personal awareness activities. The authors apply their personal sense of humor in their writing style, maintaining the reader�s attention and interest on the course material. (For example: introduction to the chapter on Energy, page 253, where we are challenged to find a "more satisfying definition" and again on Nuclear Interactions on page 257 and corresponding comments on energy conservation.) ... and aren't we always entertained with discussion on WIMPs, anti-WIMPs, MACHOs and related matter? ... and then we have the discussion on "the ingredients of planets and people� and "interstellar collisions" related to "elemental abundance". The authors, Todd Duncan and Craig Taylor, include more than the basics in this book and acknowledge that what we know today may be proven completely false in a few years with new scientific discoveries. Notwithstanding this, the book's authority is evidenced by the long list of contributors who reviewed and assisted in the development of the material presented. 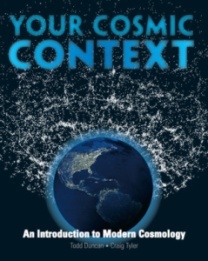 A complete Cosmology course for the price of the book: I'm in!